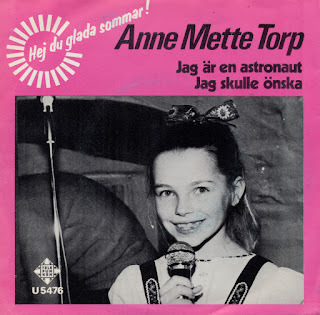 Child star Anne Mette Torp from Hønefoss (Norway) had a great year in 1973, when she shot to fame with a cover version of Ricky Wilde's 'I am an astronaut'. The song was translated into Norwegian by Elvind Torp (presumably her father) as 'Jeg er en astronaut'. She also recorded a Swedish version, 'Jag är en astronaut', translated by Rolf Lönberg, which appears on this single. In 1974, she released her debut (and only) LP 'Abra Ka Dabra', which did not include this song, but rather original songs, but also meant for children. After her singing career she took up ballet, and now runs the Ringerike Ballet School in Hønefoss.